Change up your weekend grilling with this tasty Grilled Chicken Caesar Salad with Creamy Light Dressing. The lettuce, bread and chicken are ALL grilled to perfection. The first time someone mentioned grilling lettuce I was completely grossed out. I could NOT imagine anything good coming from that. Grilling was for meat and some vegetables, I thought. However after trying a grilled lettuce salad I was hooked! Is Grilled Lettuce Gross? NO, Just the Opposite! Grilling lettuce seems totally counterintuitive, right? You’d imagine it would wilt and become totally creepy (at least that was what I imagined). 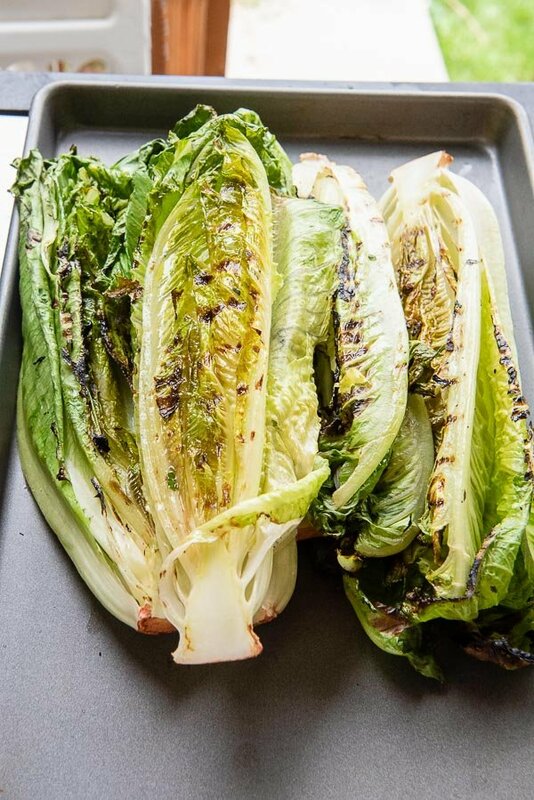 Grilled romaine lettuce is still crunchy and the flavor turns to be deeper and smoky, actually giving the lettuce some flavor (which lighter varieties often do not have much of). Perfect for Grilled Chicken Caesar Salad with Creamy Light Dressing! What Are the Ingredients for a Caesar Salad? 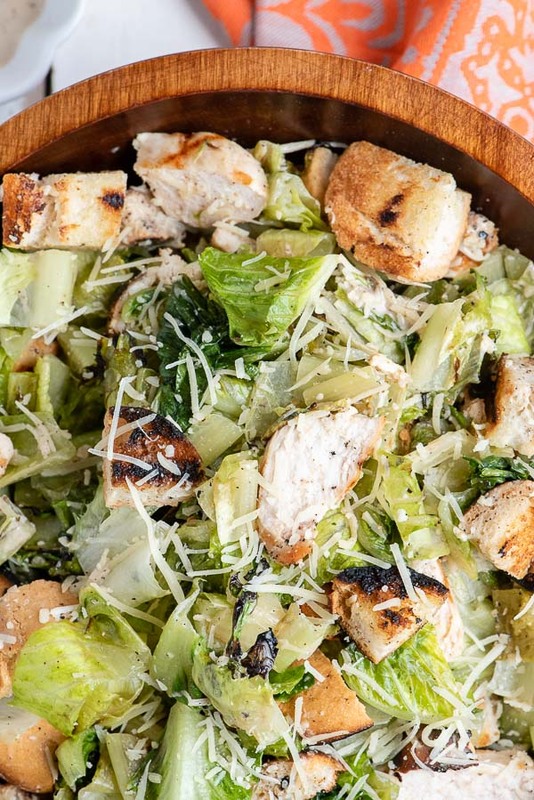 Caesar Salad is a classic and this update to a Grilled Chicken Caesar Salad is fantastic. Often Caesar Salads are made tableside in fancier restaurant and the balance of the ingredients considered a culinary art form. I love, love, love a Caesar Salad. The cool, fresh, crunchy romaine lettuce. The tangy dressing featuring distinct flavors of oil, vinegar, Dijon mustard, garlic and anchovies (don’t be afraid!). Crisp-edged croutons are a perfect finishing touch. 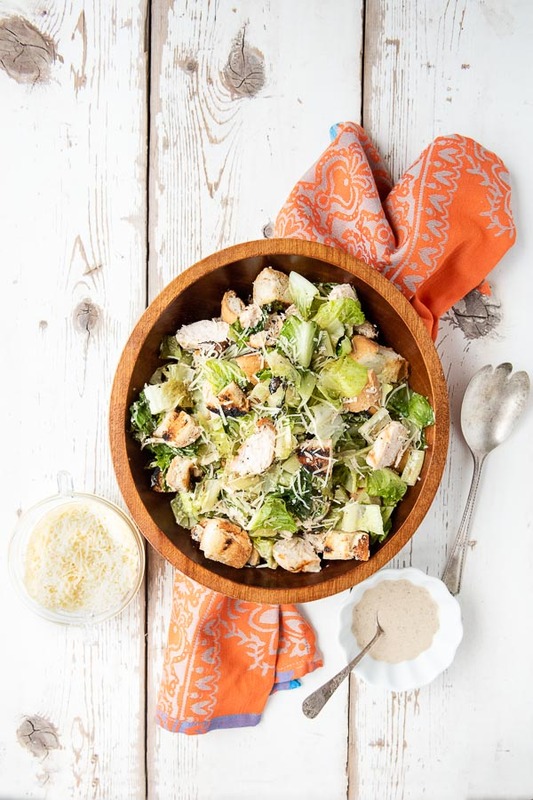 In this Grilled Chicken Caesar Salad the croutons are homemade so perfect for either those gluten-eating or gluten-free. I love some protein on the salad too to make it a full and filling entrée. The grilled chicken is smoky but still moist. With summer on the horizon a Grilled Chicken Caesar Salad is easy and quick to make. 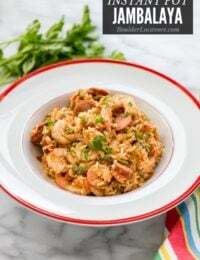 It’s a great summer option for a main dish. Why Make THIS Caesar Salad? 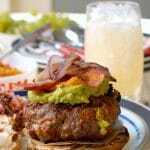 In this recipe thesucculent boneless chicken breasts, romaine lettuce and bread (or gluten-free rolls as I used) are all grilled! It adds flavor and makes clean up a breeze. The dressing has been lightened up from the traditional classic version, still retaining the signature flavors but making it forgiving to our exposed summer waistlines. 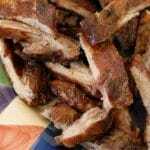 I have an easy smoking trick I learned when attending Barbecue University a few years ago. You can use a smoking box which is inexpensive but heavy duty foil works just as well. 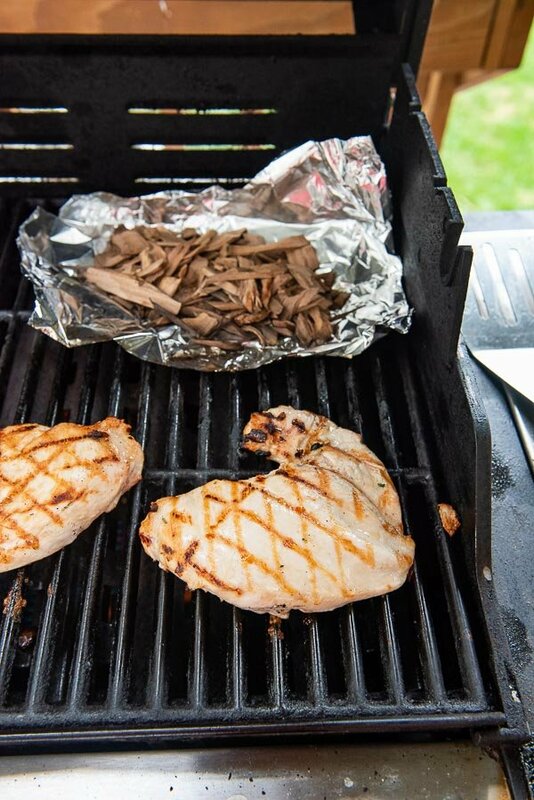 Place a piece of heavy foil on the back section of the grill and add grilling wood chips to it then heat the grill. As the grill heats the wood begins to smoke imparting more smoky flavor to the chicken breasts! 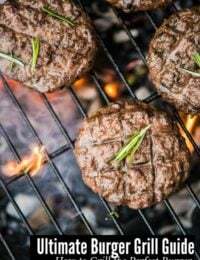 This technique is a great way to bring some smoky flavor to any grilled foods especially when using a gas grill. How Long Does Making Grilled Chicken Casear Salad Take? 12 Minutes Grilling Time! The entire salad takes about 12 minutes to grill if grilling the components in serial fashion (I’m distractable so that worked best for me); the chicken followed by the bread and finally the lettuce. The time can be made shorter by grilling the lettuce and bread at the same time but needs to be watched closely to not char them more than desired. TIP SAVING TIP: The dressing may be made beforehand and chilled in the refrigerator until ready to use it, or warmed at room temperature (though due to the sour cream it should not be left out for any duration especially in hot temperatures). Don’t let the length of the recipe scare you off. Everything is divided into sections with easy directions and no step takes more than 5 minutes! 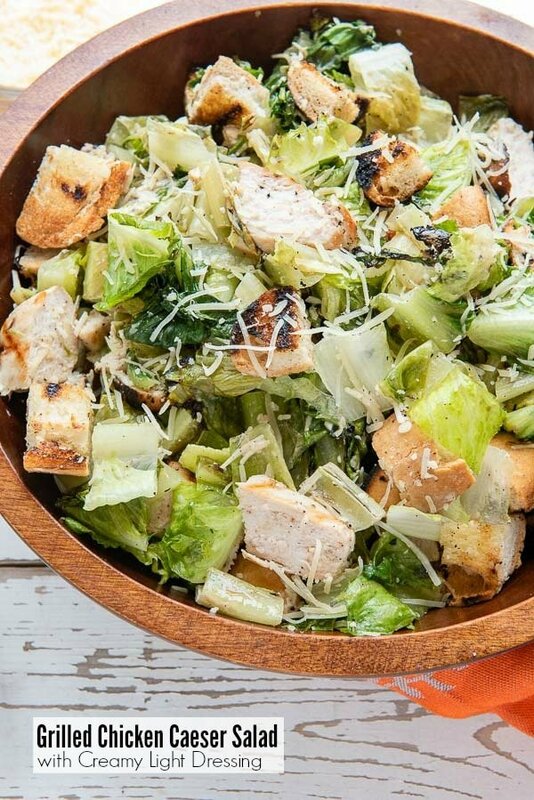 If you’ve tried this Grilled Chicken Caesar Salad recipe or any other recipe on BoulderLocavore.com please don’t forget to RATE THE RECIPE and let me know where you found it in the comments below, I love hearing from you! A fresh take on a salad classic. 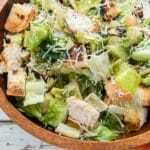 Grilling the romaine lettuce, bread or rolls and chicken for a Caesar Salad enhances the salad's flavor beautifully. A lightened up creamy Caesar dressing tops it all off. NOTE: The time to heat the grill is not included in the overall recipe time. Combine the ¼ cup of olive oil and fresh herbs in a bowl. Set aside. Add all ingredients to a small mixing bowl and whisk to fully combine. 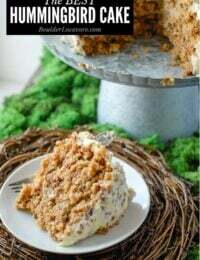 Cover and set aside or refrigerate if using later. Heat the grill to medium heat at 350 degrees (gas or charcoal). Clean and oil the grill. If adding smoke to the chicken follow the next step instead. While the grill is heating, place the chicken breasts between two sheets of wax paper and pound them to an even thickness. They should be aproximately 1/2-inch thick (refer to the grill photo). This ensures even cooking. Lightly brush one side of the chicken breasts with the olive oil-herb mixture. 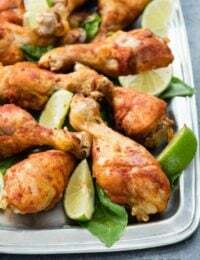 Place the chicken breasts on the prepared grill, olive oil brushed side facing the grill, for 1 ½ minutes with the grill lid closed; rotate 90 degrees and cook for another 1 ½ minutes (the rotation makes the great grill marks). Lightly brush the top of the chicken breasts and flip them over on the grill. Grill 1 ½ minutes then rotate 90 degrees and cook another 1 ½ minutes. The internal temperature of the chicken breasts should register 160 degrees on an instant read thermometer and any juice will run clear. Note: if using smaller chicken breast portions modify the cooking time to not overcook. Remove from the grill to rest. 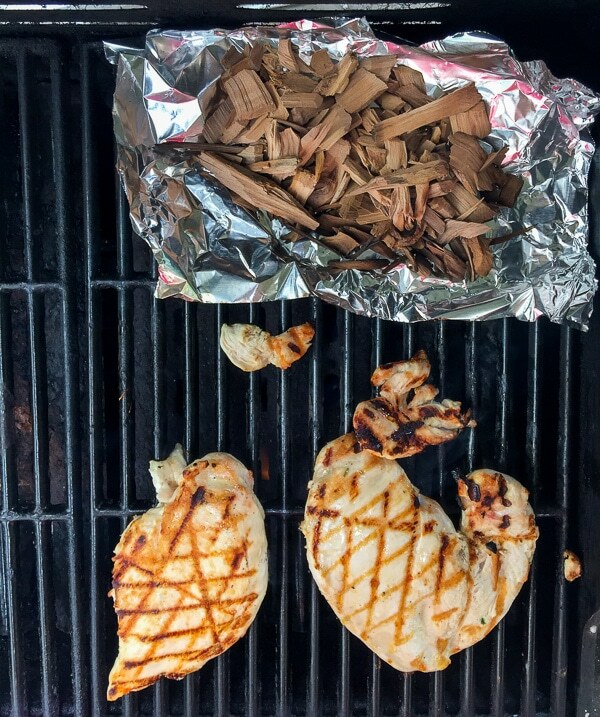 Carefully remove the foil and wood chips if smoking. If using rolls slice them lengthwise. Brush the cut side lightly with the olive oil-herb mixture and place face down on the grill. 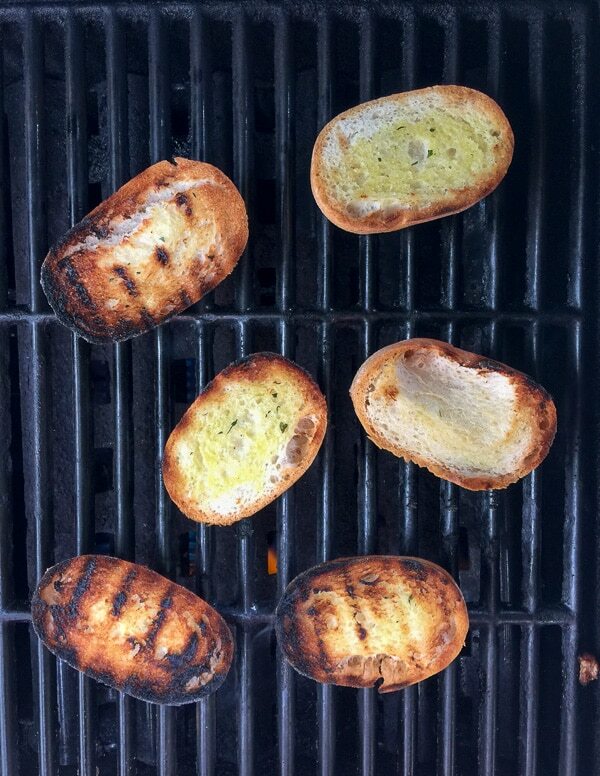 Brush the top side of the bread/rolls with the olive oil mixture while on the grill. Watch carefully and flip over as soon as grill marks appear (30 seconds to 1 minute per side). Set aside. Remove any damaged outer leaves. Slice the lettuce lengthwise retaining the root which will hold the lettuce together during grilling. Lightly brush both sides of the lettuce with the olive oil-herb mixture and place on the grill. Grill until marks appear; 1-2 minutes. Flip over and repeat. Remove and allow to rest for a few minutes. Chop off the root from the grilled lettuce hearts and discard. Slice across the romaine hearts and add to a serving bowl. Cut grilled bread/rolls into bite-size pieces and add to the bowl. Slice chicken across the breast and add to the bowl. Toss with the dressing and parmesan cheese; serve. This looks delicious. A Grilled salad just screams summer! 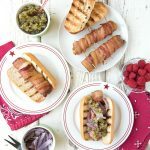 It’s so nice to bring out the grill and just grill different ingredients this season! Love this grilled chicken caesar salad recipe! I think it’s something that my husband will like as well. 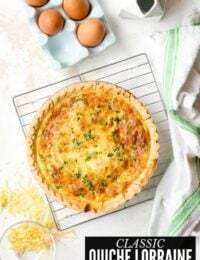 I can’t wait to try and make it, especially since we usually have salad for lunch during the summer! 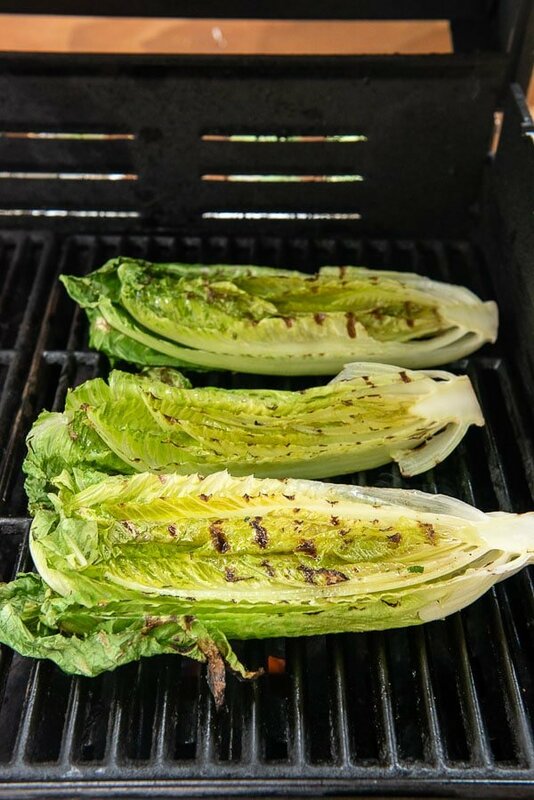 I love the idea of grilling the romaine! Can’t wait to try this out! I’ve never heard of grilling lettuce before, but I love caesar salad. I would love to try making this sometime. Thanks for sharing. 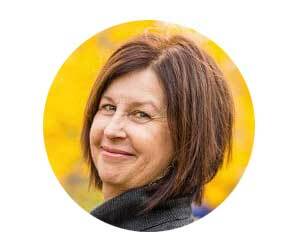 It’s a game changer, and SO unexpected! Would you ever think of grilling lettuce?! I have never thought of grilling my lettuce, now it’s all I think about. 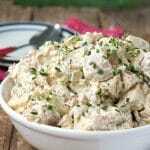 I’m all over this chicken cesar salad, perfect for any summer day. I’ve never gilled lettuce before and this looks super yummy! 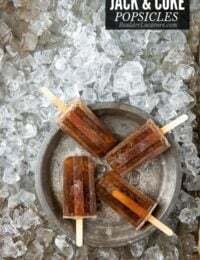 I so need to try this for summertime! I have to admit that grilling lettuce is not something that I had ever thought of. Not sure why. This sure sounds delicious. I am thinking we need to try it. I’m so excited to try this! I bet grilling just adds so much flavor!